MSNBC is reporting that thousands of Egyptians defied a government ban and rallied in central Cairo Wednesday, seeking to end the 30-year rule of President Hosni Mubarak. Police forces on the streets quickly moved in and used tear gas and beatings to disperse demonstrations. 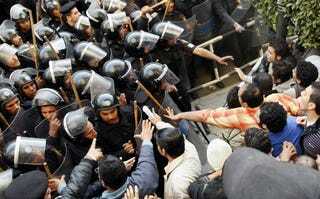 Officials said roughly 860 people were detained after Tuesday's nationwide demonstrations demanding an end to Mubarak's authoritarian rule, during which four people were killed or fatally injured. The interior ministry has banned all protest meetings. "No provocative movements or protest gatherings or organization of marches or demonstrations will be allowed, and immediate legal procedures will be taken and participants will be handed over to investigating authorities," the state news agency, MENA, cited the ministry as saying. Despite this information, Egypt's prime minister, Ahmed Nazif, said Wednesday that the government was committed to allowing freedom of expression by legitimate means and said that police had acted with restraint in dealing with Tuesday's "Day of Wrath." Beating people down and dispersing crowds through violent means doesn't really suggest or reflect democratic principles. The desire for freedom and democracy is spreading across North Africa like wildfire. The people are speaking. When will the tyrannical governments listen? In other news: Smuggle Truck Game: Run for the Border 2.0?